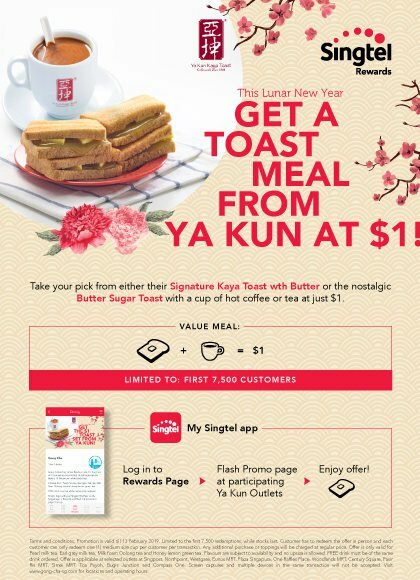 Enjoy your favourite crispy toasts (Kaya Toast with butter or Butter Sugar Toast) with a hot coffee or tea at just $1! Limited to the first 7,500 customers before 13 Feb so get yours today at any participating Ya Kun outlet! T&Cs apply. • Promotion is valid from 7 to 13 February 2019, while stocks last. • Limited to the first 7,500 customers. a regular hot coffee or tea. transaction will not be accepted. • Offer is not exchangeable for any other menu item. East Square and Shell at Jalan Ahmad Ibrahim. • Toast sets are subject to availability and while stocks last. attributable to such products and/or services. prior notice and without any liability. • Singtel’s General Terms and Conditions of Service(s) shall apply. (“General Terms”) and may be amended from time to time. NextBook by 9 Feb 2019 Scoot Promo: 50% OFF 57 Destinations Including Bangkok, Kaohsiung, Hong Kong, Gold Coast & More!